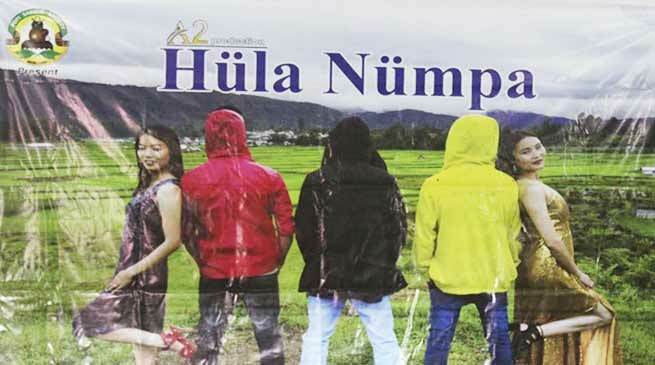 Ziro MLA released the Apatani feature film “Hüla Nümpa “(why so) , which is based on social awareness . The Apatani feature film based on social awareness “ Hüla Nümpa “(why so) was released today here NE film screening hall, Ziro point at Itanagar by Ziro MLA Tage Taki. Releasing this film, Taki said as a budding state especially in the field of film making or all audio visual field our state is weak. Not only in Apatani community but all the community is weak because of multi dialogue in state and the film maker did not get market especially community based film. Our state film makers producers, especially community base film facing lots of problem, due to different dialogues in state. So film makers of state to hard work for unification of dialogs or langue’s so every Arunachalee can understand language which film will be sued. Which can helps the film makers to get market. Song and poetry form can very easily or quickly can intermingle or promote our dialogs. In this form we can make our dialogues unification and it can help to get market to our states film maker and also our state dialogues can be preserved or promote. Taki lauded the efforts of the Hüla Nümpa team in bringing out the film. He also suggested them to use their creativity and employ a marketing strategy to make their film a commercial success. The film, whose title translates to ‘why so?’ is a social commentary on the prevalence of drug abuse and alcoholism among the youths and the responsibilities of parents. It is scripted and directed by Ngilyang Aka and is produced by Kago Annu Ngilyang under the banner of A2 Productions.